William Nowicke has taken over as Think's vice president of global operations. 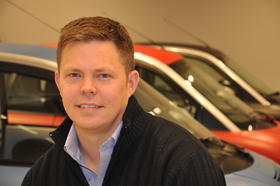 Norwegian electric car maker Think Global AS has added a former Chrysler Corp. executive to its senior management team. William Nowicke takes over as Think's vice president of global operations effective immediately. In the newly created position, Nowicke, 38, will be responsible for the company's fast-expanding global presence. Within the last 13 months, Think has started European production in Finland with contract manufacturer Valmet Automotive; refurbished a U.S. plant in Elkhart, Indiana, and started output there for the North American market; and announced plans to open new product development and engineering facilities at company headquarters in Oslo. Nowicke joins Think from U.S.-based turnaround specialist AlixPartners, where as a vice president with the firm he oversaw the successful restructuring of several manufacturing operations within the automotive and other industries, Think said in a release Wednesday. Prior to that, the U.S. native worked for Chrysler, where he held several senior-level manufacturing and manufacturing engineering positions, the release says. Nowicke is the third new executive to join Think's management team in the last four months. Barry Engle, a former Fiat Group and Ford Motor Co. executive, became Think's third CEO in September when the U.S. native succeeded Richard Canny, who is now vice chairman of Think North America. Michael Lock, a British national, spent seven years as CEO of premium Italian motorcycle maker Ducati's North American operations before starting as Think's chief marketing officer in August. Nowicke will divide his time between Think's bases in Norway and the United States.